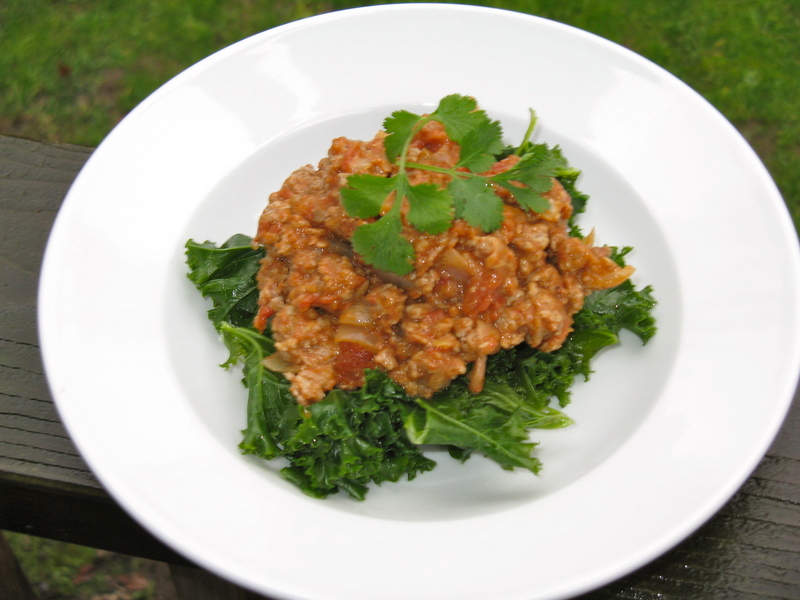 I’ve got a delicious and easy Indian-style turkey stew recipe for all of you. It features garam masala, other warm spices, creamy coconut milk and tomatoes. 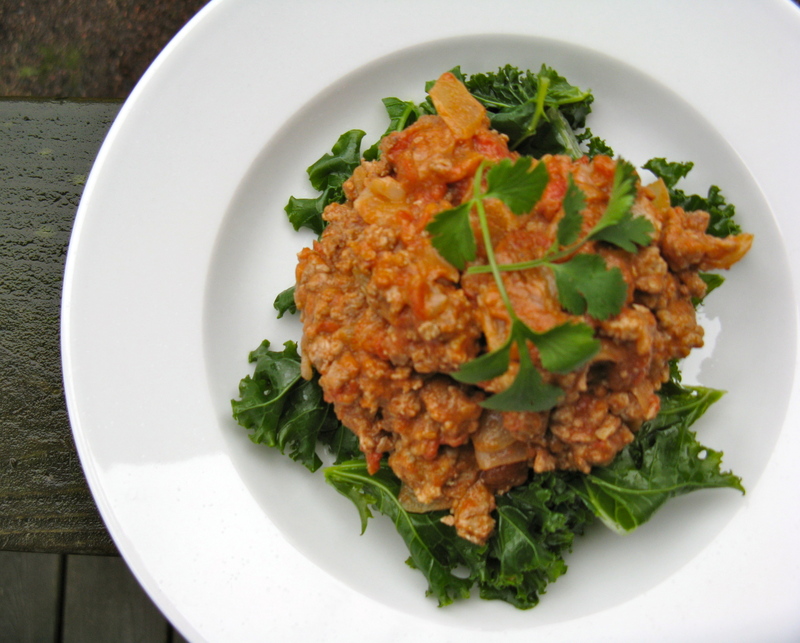 This comforting, healthy and flavorful stew is wonderful served over steamed kale, and garnished with cooling cilantro. Anyway, I don’t know about all of you, but it’s been one heck of a week. I honestly felt like I didn’t have enough time in the day to get everything done, and was tempted to give life a call and say that I wasn’t going to show up. It’s funny, because my yoga teacher said this exact same thing yesterday morning, and mentioned that she was tempted to call in and find a sub, because she wanted a break from life. But, she didn’t…she showed up anyway and shared her honesty. She remembered the bigger picture, and the notion that when we show up on the days we feel like throwing in the towel, we often have the richest experiences. Everything she said was so reminiscent of my week. I was drowning in assignments, studying, writing, work and projects, and wanted so badly to stop everything. I wanted a reprieve. Instead, I moved forward and did the best that I could, knowing that giving up was not an option. What good w0uld it do, and how would it benefit me? I have goals and aspirations, but challenges and struggles are always going to present themselves. It’s part of the process, and how I face these challenges is reminiscent of my character. This journey is not meant to be easy, and this week especially, I needed that reminder from my teacher to embrace it. Melt the coconut oil in a large pan over medium heat. Add the onion and garlic, and saute for a couple minutes. Next, add the ground turkey and break up the meat with a spatula. Season to taste with sea salt and pepper, and allow meat to brown for several minutes. Next, add the spices, diced tomatoes and coconut milk, and mix well. Continue to cook for a few minutes over medium-low heat, until mixture thickens up a bit. Then, mix in the ghee, butter or coconut oil. Serve over steamed greens of choice (I recommend kale) and garnish with cilantro, if using. It seems everyone is having one of “those” weeks. TGIF! Isn’t it funny how things work out that way? We had Indian this weekend and I was thinking about how much I enjoy the Indian flavors. I am adding this stew to my must make list!